This is my second wedding. I am 54 years old. My height is 5'3'' and I weigh 150 pounds. I am pear shaped with a small waist. My top is a 38D and I'm not sure of my hip measurement. I do have a slightly "poochie" stomach. I wear a size 10 or 12 petite pants, depending on the style. Given my research, I think an empire gown would be most flattering to my body type, but am unsure. I do not want anything strapless or spaghetti strapped. A modest off the shoulder would be fine. But I really like something sleeveless or cap sleeved. If there is a train, I would like it to be understated... maybe a mermaid style train. My favorite style is vintage 1920's- a gatsby-style. I would like the dress to be ivory or soft champagne. HELP... I have strong opinions of what I want, yet I can't seem to find what I'm looking for. It sounds like you are on the right track with your wedding dress style choice. I've been looking around for a match for your body type and style choice. Eden bridal has some possibilities. I looked in their Silver Collection, which is their informal gown collection, and found a couple of styles you could consider. Basically for a pear shaped body type the a-line silhouette is the most flattering. An empire or raised waist gown will hide the stomach and midsection, if needed. Fabrics like chiffon and soft satin, have great hiding power and are slimming because they skim the body and don't add weight. 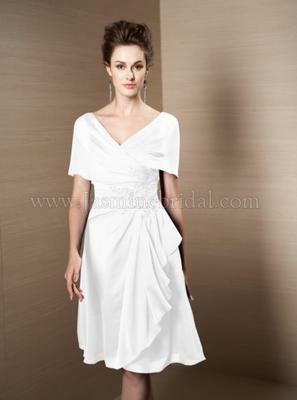 Cap sleeve and off the shoulder sleeves add width at the shoulders which help to balance the hips. But you also will look good in a dropped waist gown or a gown that has diagonal ruching or pleating in the bodice. From your description you want a floor length gown with very little to no train. The 2 short dresses above by Jasmine Bridal in their reception dress collection, can be ordered in floor length. The off the shoulder by Davinci Bridal is an a-line with ruching that chisels down the waist and stomach areas. Most wedding gown designer gowns take any where from 4 to 6 months to receive once you order, so I hope you have given yourself ample time to really search. 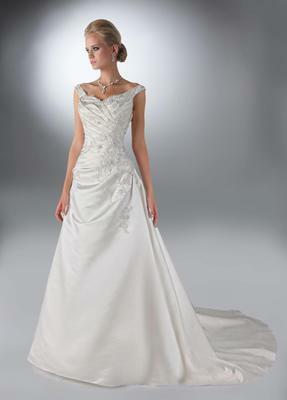 I know you can find what you are looking for and you can get most bridal gowns in white, ivory and some other colors. This was some really great advice on how to help find the right wedding dress. There can never be enough information available so brides can make informed decisions.